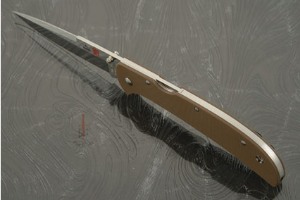 Description: Al Mar now offers an Eagle Heavy Duty model. 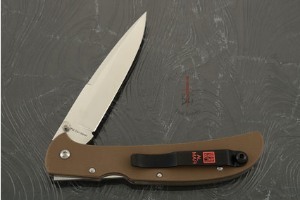 Built for the individual that carries the Eagle Ultralight for their “EDC” and wished they could have a tougher version with the same features as the SERE 2000. This Eagle Heavy Duty (5HDET-ZL) includes a blade formed from ZDP-189 powdered metallurgical stainless steel. 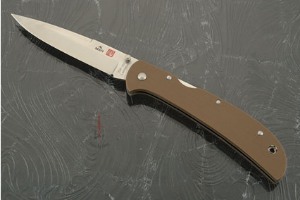 ZDP-189 is considered by many to be among the best blade steels ever made. It has truly amazing edge holding. The “HD” weighs in at only one ounce more than the Ultralight version, partially due to skeletonized heat treated 400 series stainless steel liners. 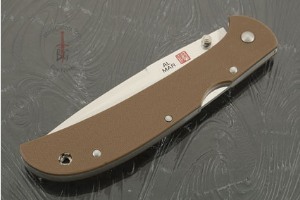 It sports textured flat dark earth G-10 scales, adjustable action, dual thumbstuds and a reversible/removable pocket clip system (mounted for tip-up carry) which attaches through the lanyard hole. Just as the Eagle Ultralight is very easy to carry and disappears in your pocket, so does the Eagle Heavy Duty. 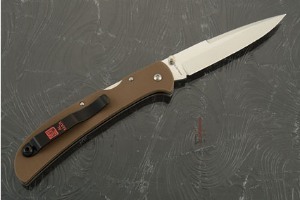 An excellent choice for those that appreciate the classy aspects of an Al Mar knife, but desire increased toughness.